Ready to take your career to the next level? 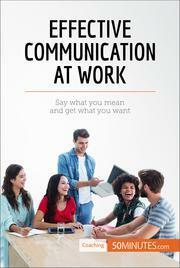 Find out everything you need to know about effective communication at work with this practical guide. Do you struggle to develop relationships or make yourself heard at work? There is a good chance that this is down to a lack of communication, an extremely important yet often overlooked professional skill. Gone are the days of struggling to assert yourself or build relationships with colleagues; this guide will give you all the information you need to reap the rewards of effective communication!